I had time to spare and was kinda bored at the hotel in Cebu. I looked out the window around noontime and noticed the cloud formations were ever-changing. Was hoping to take a video using my digicam but unfortunately, the red battery blink of death dawned upon it. Turned to my celphone to take a video but my memory card was full. So it kept me thinking what could I do to record a video. Then I instantly remembered that my new laptop had a very decent built-in webcam. So I took out the ironing board, placed it beside the window, placed the laptop on top, and set the webcam to record. After a few tries, I figured out how to set up a few things for a smooth recording. Since it was a new laptop, I had Gigabytes of space to use. 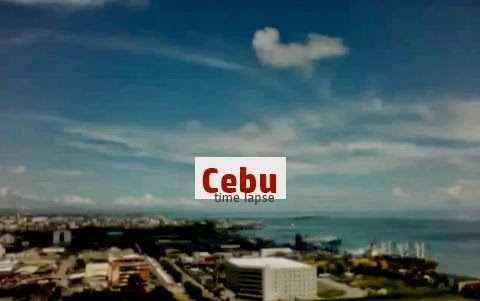 So I left the laptop recording the Cebu pier area and went down to SM City for lunch. I completely forgot about the laptop and went window shopping afterwards. Came back to the hotel 4 hours after and suddenly remembered the laptop. Stopped recording to check if it saved it all and it did! Looked around for a good free video editor to speed up the video. The video looked nice at 12x faster but it was a whopping 30 minutes. I wanted something faster and cranked it up to 144x. At this speed, you'll see boats and ships gliding through the water faster than an ant! So here it is. Taken from the 20th floor of Radisson Blu hotel on a Sunny Saturday afternoon. What do you think? ang galeng ng cloud formation!! Thanks Az! Nakakaaliw tuloy ang timelapse. And I used actual video instead of times photos. Ang bigat ng raw video ko! haha!